A vintage style Jumbo Bag in a lovely duck egg blue. 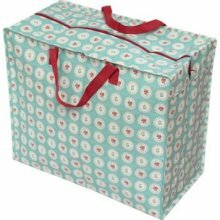 Great for storing bedding, clothes, laundry, or taking on holiday. Fantastic for the beach or tidying toys. Pretty, practical, and strong.